Thundering Hooves silenced, so where’s the grass-fed beef? Close your eyes, vegans: there’s the beef. Joel Huesby, in his meat locker at Thundering Hooves. As for the whys and wherefores that led to the closure? It’s a long story, told in short via Seattle Times-affiliate the Walla Walla Union-Bulletin (read it here). But the story I want to know, is this: With Thundering Hooves silenced, where’s the grass-fed beef? I called a few of the company’s biggest fans — the chefs and restaurateurs who’ve come to rely on their product — to find out. Where’s the grass-fed beef? Hiding under this two-fisted Secret Squirrel BBQ Burger made with ground beef from Long Valley Ranch — a special this month at Blue Moon Burgers. Since then, Blue Moon customers have been enjoying Long Valley Ranch’s pasture-grazed beef from Oregon — available at local retailers including Metropolitan Market, Madison Market and Tacoma Boys, as well as Uwajimaya — where you can sample Long Valley Ranch beef this Saturday at the flagship store in Seattle from 11 a.m till 4 p.m.
Olson says he’s ultimately looking toward sourcing his beef from a different ranch for each store (a third Blue Moon is slated to open in the Joule building on Capitol Hill in June). “You get to the point where one rancher, in a sustainable-ranch format, can’t supply you with the amount of beef you really need,” he says. 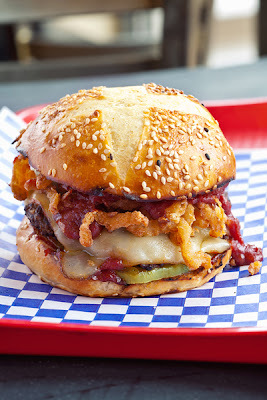 Grass-fed beef is offered as an “upgrade” at Uneeda Burger in Fremont. The meat is 100 percent Wagyu (Kobe) beef from Whidbey Island’s Crescent Harbor, says chef/owner Scott Staples, whose classic burgers are made with ground meat from Painted Hills. His Restaurant Zoe and Quinn’s Pub — sold Thundering Hooves beef until recently. “I heard they were having supply issues,” Staples told me, which was one of the reasons he chose another purveyor when Uneeda opened in December. So, what’s on the table at Zoe and Quinn’s now? It’s pasture-raised Walla Walla grass-fed beef, says Zoe’s chef de cuisine Daniel Newell. Beef from neighboring ranchers that once supplied cattle to Thundering Hooves — whose short ribs and beef tongue had long been a staple at Staples’ restaurants. Thundering Hooves’ local distributor, Corfini Gourmet, “had a sense something was going to happen, so they started to talk to other ranchers,” explains Newell. Those ranchers had been breeding cattle sold to Thundering Hooves, who’d “raise and graze them,” Newell says. Like Blue Moon’s Olson, Birk turned to Long Valley Ranch to provide beef for the Boathouse. The burgers now served at Ray’s Cafe are made with certified organic grass-fed beef from Skagit River Ranch. 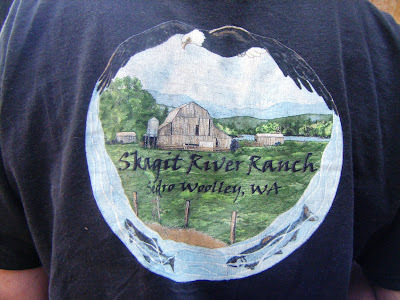 Skagit River Ranch, in beautiful Sedro Woolley. Sourcing local beef has been no picnic, Birk admits. When Ray’s first made the switch from Nebraska beef to Washington product, he turned to Vashon-based Misty Isle Farms. “They had a big push on the market and then they disappeared.” When he turned to Thundering Hooves, “it worked fabulously” — until now. So, who’s a fan of grass-fed beef? And where, do tell, do you find it? 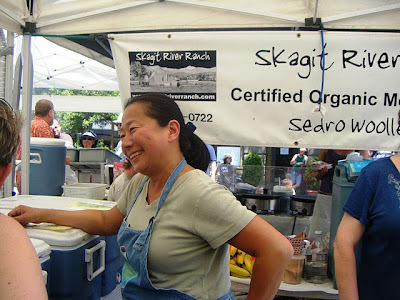 Eiko, seen moooving some beef and other products humanely raised at Skagit River Ranch, chats with a customer at the Ballard Sunday Farmers Market.